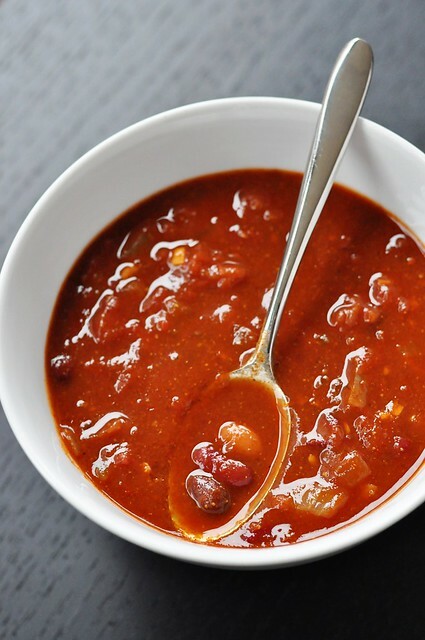 Everyone has a chili recipe, a comforting, go-to, maybe even committed to memory pot of warm, hearty goodness that emerges when the weather goes cold. A glimpse into one person’s bowl usually conveys an opinion on beans. 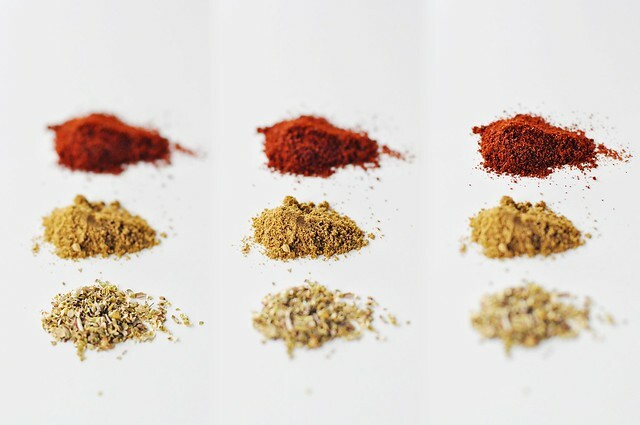 A spoonful can tell you whether they have a taste for heat. Is it thick enough to stand on a plate or does it lend itself to a bowl and a spoon? You know yours. There’s nothing fancy about my chili. I don’t break out the chipotles or sneak in a square of bitter chocolate for intrigue. It’s straightforward—tomatoes, beans, a bottle of beer for good measure. Spiced but not too spicy. Its main ingredients come from a can. But despite its seemingly average composition, it is an excellent chili. The flavor is balanced and those three beans–black, kidney, pinto–make it substantial and deeply satisfying. As further evidence in its favor, I can offer the fact that the recipe yields enough for us to have dinner for three nights in a row (it could be four if we didn’t always fill our bowls to the brim), and yet I have made it at least once a month since September, always to Chris’ excitement. Shouldn’t we have tired of it by now? Although, one of the better attributes of this chili really is its ability to feed us for a few days. It’s nice to take the pressure off and helpful to have something at the ready when you have a busy week ahead. For instance, I cooked up a batch before we left for the holidays and, while we were thick in the chaos of packing and gift-wrapping, all I had to do was set the pot back on the stove for a few minutes and we had dinner. We were able to keep the kitchen clean and still have a healthy, inexpensive, home-cooked meal each night. And if you have more mouths to feed or want this to stretch even further, it sits beautifully atop of a scoop of brown rice. 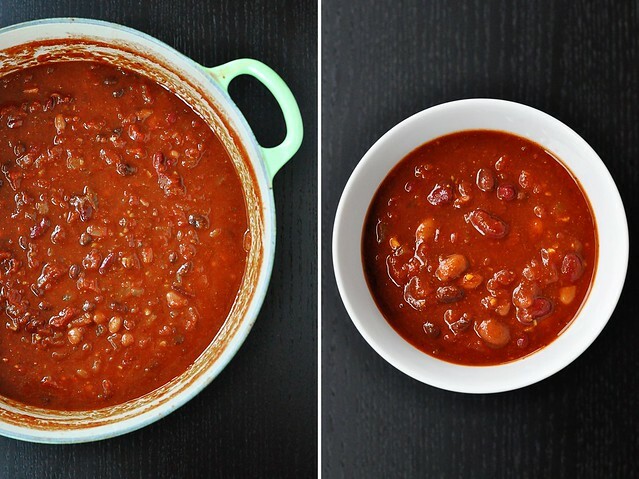 The difference between this chili being gluten-free or not lies in the choice of beer. If you’re not gluten-free, simply select your favorite brew. If GF is a necessity, make sure to choose a bottle labeled as such. Also, since this recipe is one that I use to make my life easier, I measure the spices by pouring a roughly tablespoon-sized mound into the palm of my hand. You can certainly use spoons, but I wanted to share in case you too like a more hands-on approach. Heat the olive oil in a large pot over medium high heat. Add the onions, sprinkle with a pinch of salt, and saute until tender and golden brown. Add the garlic and cook for about a minute, until fragrant. Stir in the tomato paste. Once the tomato paste has melted into the garlic and onions, pour in the bottle of beer and scrape up any browned bits from the bottom of the pot. Let the beer simmer and reduce by half (feel free to turn up the heat a bit to push this along). Turn the heat down to medium-low. Add the tomatoes by hand, breaking them up coarsely and discarding any skins and hard stem ends. Pour in their juices. Add the chili powder, cumin, and oregano and stir to incorporate. 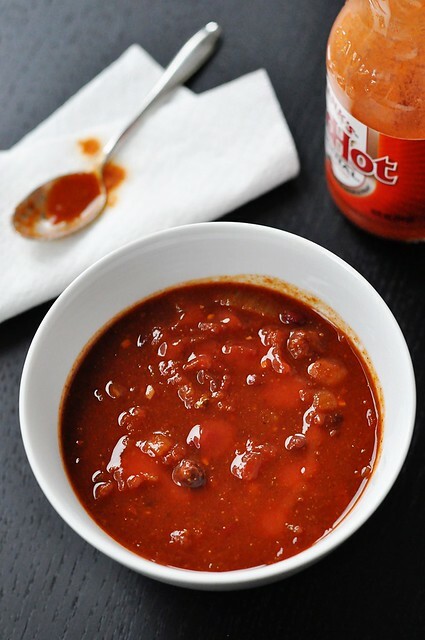 Lightly drain the beans–about a one-second pour over the sink using the lid of the can to hold the beans back is good–and add them to the pot. 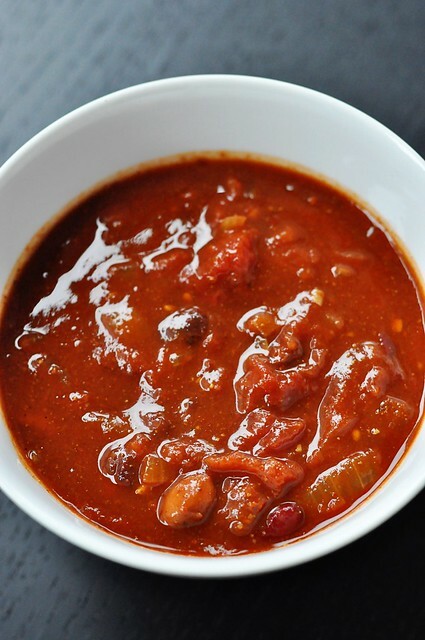 Bring the chili to a simmer and cook everything together for at least 15 minutes; it will hold its own over low heat, stirred occasionally, for much longer if needed though. Can be made in advance (one of those things that is even better the next day) and will keep refrigerated for about a week.